Seniors in sports are nothing new. Pahrump has many seniors that have been active, but perhaps not enough. What are seniors doing around Pahrump for activity? Elderly people are constantly looking for a sport that promotes fitness and involves more than just walking around the block every day, but they find themselves asking what sport they could get into that won’t get them injured. Paula Callahan, a personal trainer in Pahrump, said seniors need to start off slow and take two to four weeks to allow their bodies to adapt to whatever activity they are getting into. She recommends a week of walking to start, at 20 minutes a day and then increasing that to 30 minutes a day the following week and so on. In Pahrump, the seniors are active. They play golf, horseshoes, softball, they lift weights, they shoot and they swim, to name a few. Are some of these sports better for you than others? Sure, it’s a personal preference. Like Callahan said, one has to know their body and how much exercise it can take – and start slow. 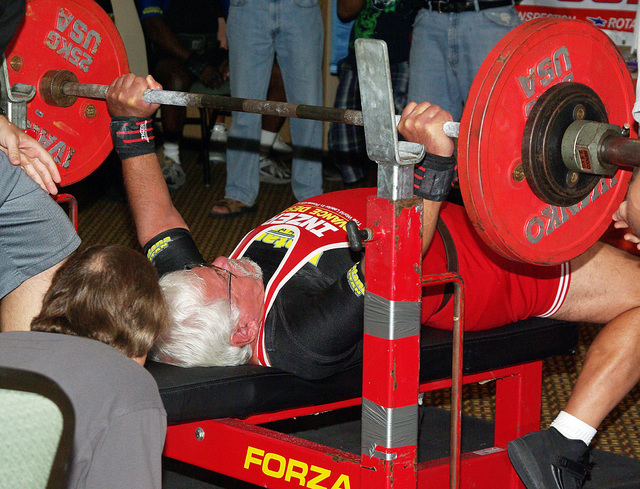 Some seniors have found that weightlifting can keep you in shape and keep the heart going. At 92, Rodney Graves is a World War II veteran, and still lifts weights competitively. He started doing this at a late age. “I started doing this to keep my mind off my wife who had just passed away,” he said. His weightlifting partner, Bill Prince, is also a senior and still lifts competitively. He said two years ago that he lifted for the cardio. Prince is still going strong at nearly 78 and is a regular fixture at Custom Health and Fitness gym and he teaches powerlifting if you would like to do it in a competition. Arceo is the trainer you want to contact if you want to get into weights to keep you healthy, but don’t want to get into powerlifting. He has been known to help all ages get in shape, but he also has the knowledge to help seniors improve their range of motion through exercise. He also trains at Custom Health and Fitness at 3640 S. Highway 160, (775) 537-6061. Simply put, Arceo believes that the more muscle mass a person has, the easier it is to burn those calories. He said most of his clients want something and if they want it badly enough they will work hard for it. Seniors who don’t want to put a lot of strain on the body but want to work all their muscles should try swimming. Oliver Gruter, a Pahrump senior, loves to swim now, but it hasn’t always been that way. He told the PVT in 2014 that he was not a swimmer growing up. He grew up playing basketball and even went semi-professional with the sport. It wasn’t until late in life he realized that swimming was good for him. He had children who swam like fish and they eventually convinced him to swim. Golf is another sport Pahrumpians are into. The sport has been compared to watching grass grow, but don’t let it fool you. 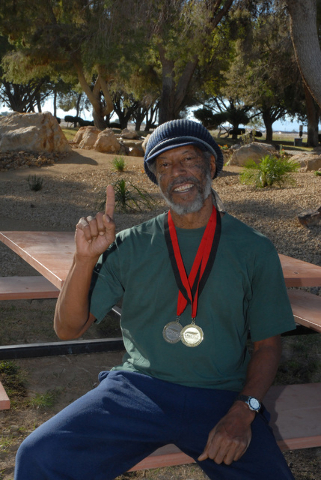 The two golf courses are a hotbed of activity for seniors all year long who love to get out and walk the course. One can burn some calories walking with a set of clubs depending how much you play and where. Tonopah golf coach Robert Otteson said a typical golf bag with clubs can weigh anywhere from 15-30 pounds, depending on what you put into it and a golfer can walk a good four to five miles, depending how many holes are played. “Golf requires coordinated muscle use (hands, wrists, abdomen, legs, back, knees, etc.) and golf requires excellent hand/eye coordination to be good at it,” Otteson said. He adds that the Associated Press has named a golfer as the male athlete of the year 11 times and the female athlete of the year 24 times and pointed out that Tiger Woods is the richest athlete ever and was the first athlete to make a “billion” dollars in earnings and endorsements. Some seniors require something that requires less strain on the back. The good thing about this next sport is one can win money at it if you are good. For most people, the horseshoe throwing action at Petrack Park goes unnoticed. Did you know that if you played softball or baseball, one could be good at this sport. Kim Bradshaw, a Pahrump softball player, said that she is playing more horseshoes because softball is taking a toll on her. For those that want to get into this sport, Mike Norton is the man to seek out and he usually can be found at Petrack Park throwing shoes.